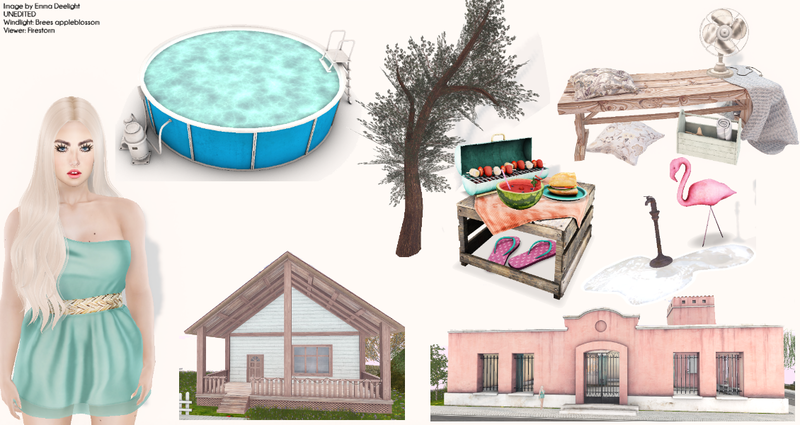 Today I am featuring Runaway @ Hair Fair, Raindale and KC @ Cosmopolitan, Kalopsia, 7 Emporium and Brocante @ Summerfest, Raindale @ The Home Show, Serenity Style @ The Project Se7en, Ionic @ The Chapter Four. Plus Serenity Style @ MadPea Hunt and a group gift from KraftWork. I am wearing hair from Runaway @ Hair Fair. There is only one week left for this amazing hair event. The dress is from KC @ Cosmopolitan. It's made for Maitreya, eBody, Belleza and Slink. It includes a color HUD with 22 colors and prints. From the Summerfest event I have pictured a handful of items from the Kalopsia picnic set. The swimming pool, with PG animations, is from 7 Emporium. The sign is from Brocante. I have also pictured the bench, pillow decoration and tree from Raindale @ The Home Show, which opens on July 8. The bench has solo and couples animations. From Serenity Style I've used the rare fan available @ The Project Se7en. The beach carry box is available on the MadPea Hunt. The house with balcony is from Raindale @ Cosmopolitan. The background house is the rare La Haciendita from Ionic @ The Chapter Four. Lastly, the rusted tap is a group gift from KraftWork. There is a L$25 group fee and a number of gifts available for collection. I hope you enjoy today's backyard look.